Ragwood and echinacea are members of the Asteraceae family. This family also includes: lettuce, chicory, global artichoke, sunflower, daisies, tarragon, sagebrush, sagewort, wormwood, mugwort, calendula, echinacea, dandelion, chamomile, yarrow, lobelia, asters, zinnias, chrysanthemums, helenium, fleabane, marigolds, dahlias, milk thistle, and safflower. Everybody’s system is different, but if you know you have a ragwood allergy, you may react negatively to echinacea. 2. 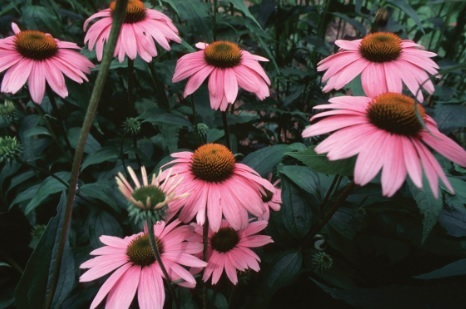 How do you know if you are reacting negatively to echinacea? If you take echinacea to help you fight a cold and you get worse, you actually might be experiencing an allergic reaction. Also, if you have, or think you might have, an autoimmune disease, taking echinacea is not recommended and should only be done under the supervision of someone who knows what they are doing. A plant from a different family: garlic. Also a surprising number of “old school” herbalists recommend zinc supplementation if you are fighting a cold. Get your zinc from a high quality source and use it sparingly. It’s definitely not a supplement that should be taken every day. As always, inform yourself, pay attention to your own reactions, use your own common sense and – here comes the disclaimer – seek a licensed health care professional for medical advice. This entry was posted in "Weeds", Medicine. Bookmark the permalink.